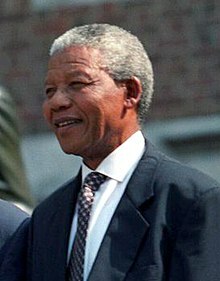 Nelson Mandela (ᏲᏁᎦ: Nelson Rolihlahla Mandela; ᎦᎶᏂ 6‚ 1918 – 2013) ᎠᎵᏱᎵᏒᎧᏃᎮᏗ ᎤᎦᏃᏮ ᎬᎿᎨᏍᏛ ᎠᎴ ᎢᎬᏱᎢ ᎠᎬᎿᎨᎢ ᎠᎺᎵᎨ ᎤᎬᏫᏳᎯ ᎨᏎᎢ. Nelson Mandela is a stub. You can help Wikipedia by expanding it.